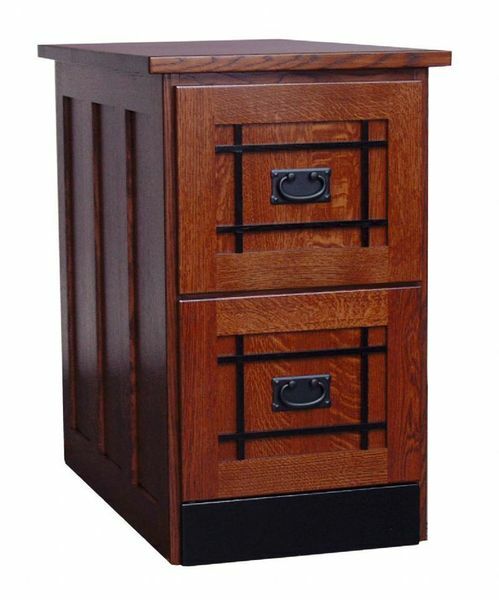 Our Mission 2 Drawer File Cabinet comes in your choice of Oak Wood, Cherry Wood, Walnut Wood, Hard Maple Wood, Quarter Sawn White Oak Wood, Hickory Wood, Rustic Hickory Wood, Rustic Cherry Wood or Brown Maple Wood. We offer a wide variety of stain options and finish samples are available upon request after you place your order. The filing cabinet drawers are dovetailed and on full extension drawer slides with a weight capacity of 100 pounds. Drawer bottoms are solid oak plywood, panel sides are raised and a 1" thick frame is standard. This Filing Cabinet can be purchased with upgrades like legal width size, raised panel back and locks. I just wanted to pass on to you that the new Desk and File Cabinet arrived this evening, delivered by a nice guy named Garry and his sidekick Bill. So far, from what I can see in the evening lamp light, it is BEAUTIFUL, and I have yet to find any defects. It appears to be built to specifications. The stain appears a bit darker than we were anticipating, but that is by no means a problem – it still fits in rather well with other pieces we have. The computer is set up – I’m typing on it. I’m very pleased. Thank you both so much and please pass my regards to the woodworker.